The two oldest grand-monkeys (ages 4 & 5) were visiting this week. We hiked to a waterfall, flew kites, played outside, watched movies, painted, did crafts, and just generally had a lot of fun. One of our excursions was to A Stitch In Time, one of the two local quilt shops in Franklin, NC. If you’ve not had the opportunity to visit this shop, you really should. It is probably the most beautiful quilt shop I’ve ever been in. And the staff there is super nice. I had the pleasure of working with them for 2 weeks over the last shop hop and they are a great bunch of ladies. Of course, I was there to show off the grand-monkeys because they are the cutest things in the world. While we were there though, I bought grab bags for each of them. A grab bag consists of fabric pieces less than 18″ x WOF. The idea was to take whatever was in the grab bag and help them create a project during the week. So they each picked out a bag and we headed to the car to open them. 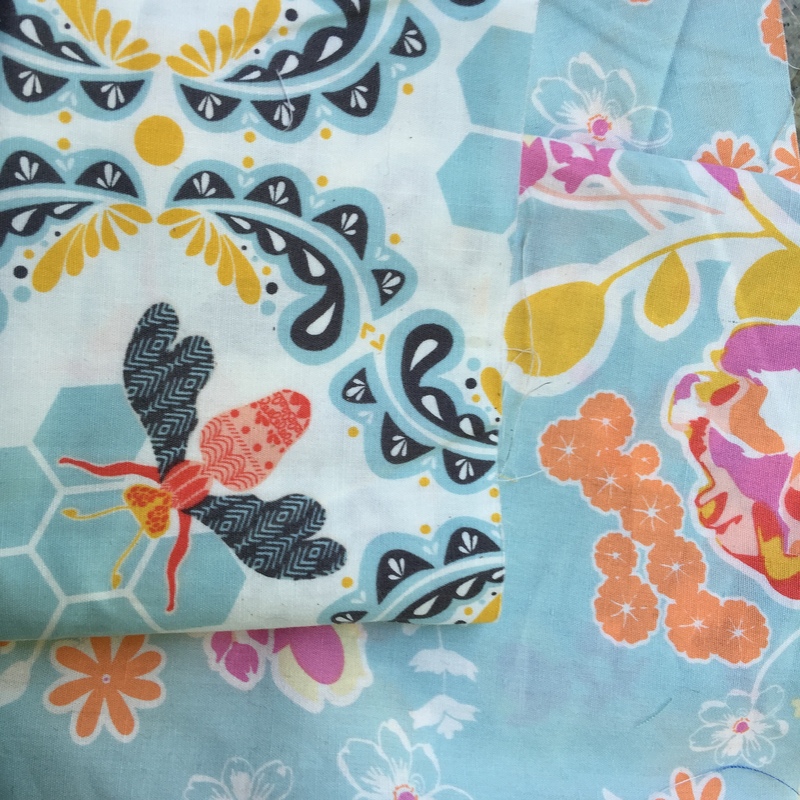 “R” opened his bag and found two lovely floral Art Gallery prints by Bonnie Christine from her Sweet as Honey line. If that had been my grab bag, I would have been ecstatic since Art Gallery fabric is my absolute favorite and I have been drooling over that line. But, being a 4-year old boy, he wasn’t very impressed. 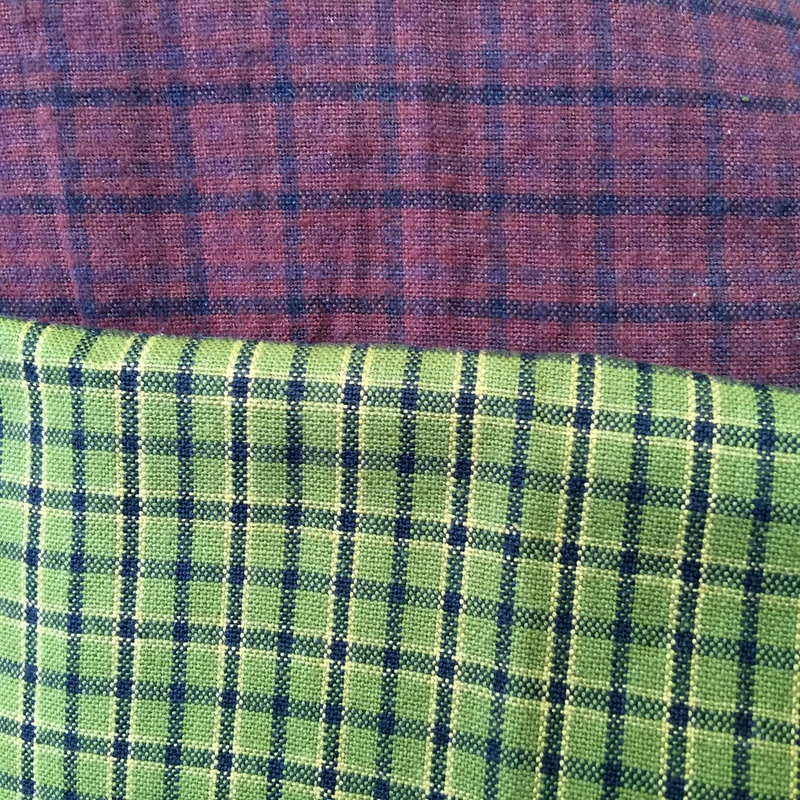 And then “E” opened her bag, and out dropped two dark plaid fabrics. Well, needless to say, as a 5-year old girl that loves flowers, she was a bit shocked to have such dull, drab fabric. So, they decided one was ‘girl’ fabric and the other was ‘boy’ fabric, they switched, and then they were both perfectly happy. Phew… I love it when things work out. We bounced around a few ideas for what they wanted to make from their fabric, and R decided he wanted a hat, and E wanted a quilt. 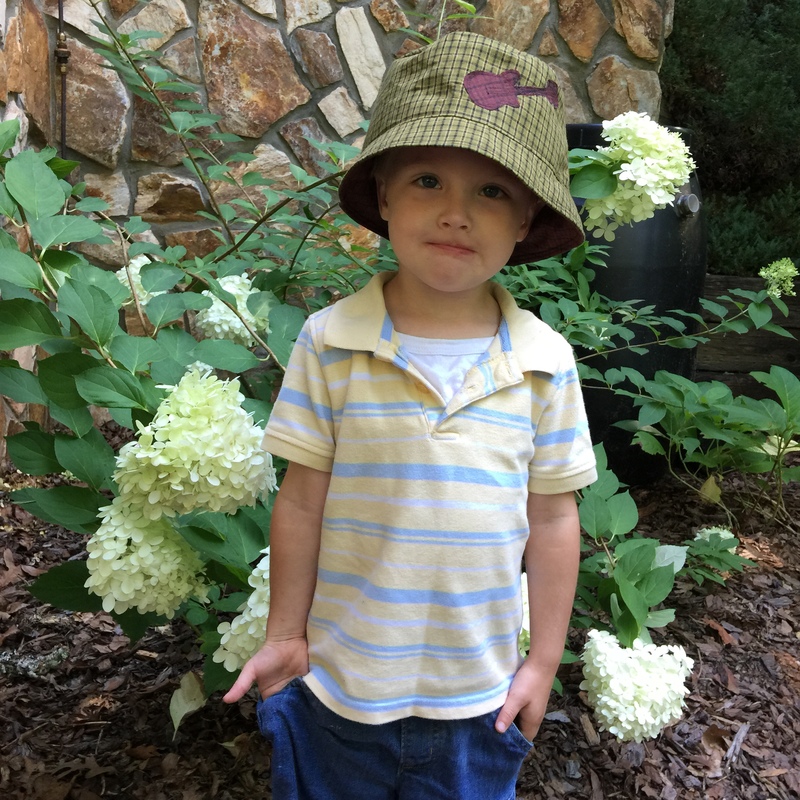 For the hat, we used the Bucket Hat tutorial from Sew Much Ado. We needed to make our hat a bit larger than the pattern pieces provided in her tutorial, so I cut the round circle for the top of the hat 1/4″ larger all the way around. And I cut the bands 1/4″ longer than the pattern which made each piece 1/2″ longer overall since it was cut on the fold. Not sure if the math works exactly for enlarging a pattern, but it went together just fine. I had him help me put the last stitches in it so he could say he helped make it. It turned out super cute and he loves it. The shop owner, Maxie, also gave E an 8-pack sample of Benartex fabrics that were 8″ x 10″ each. Since E wanted a quilt, I figured we could somehow use those with the AGF prints and make a small doll quilt or something. But then she stated that she wanted the quilt large enough to fit her. Ummm…. Ok. What can I pull together to accomplish this? 99.9% of my fabric stash is still in storage, but I did bring my scrap bucket with me. So we started raiding it. 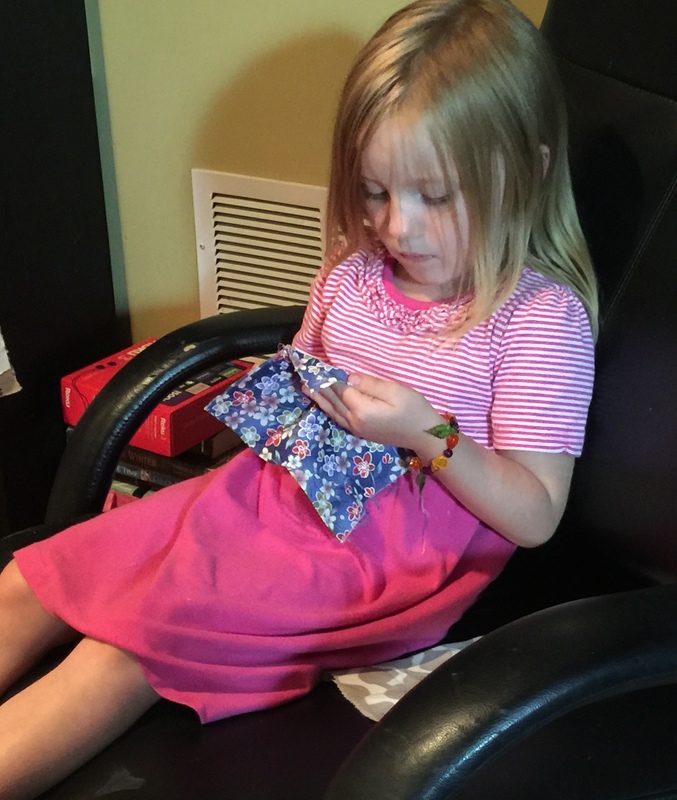 She picked out what she wanted, and that along with what she got from the quilt shop is what we used to make her quilt. Nothing matches… there are baby prints, spiders, fireworks, florals, birds, and even some metallic prints. But she loves it! It’s her creation, and she has put every stitch in it (with my help of course). And that’s all that matters. 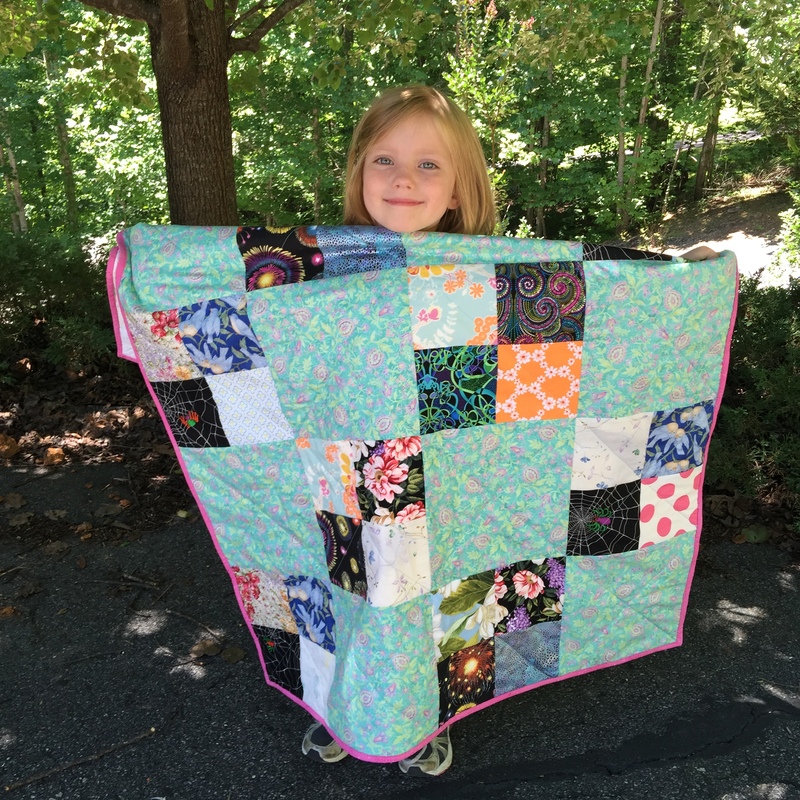 I am super proud of her first quilt. Oh, and she loves picking out stitches. This entry was posted in Quilting/Sewing and tagged agf, art gallery, bucket hat, first quilt, grab bag, hat, quilt by monkeyneedle. Bookmark the permalink. Congrats to your grands on their finishes! You should keep E around, a kid that loves picking out stitches is handy to have! Oh what a gorgeous first quilt! I love the use of different sized squares and hurrah for the scrap pile for padding it out a bit! Thank you. She is so proud of that quilt. I hope I can help her make more in the years to come. I’m so glad your “grand monkeys” got to have fabrics of their own and to have a special hat and a quilt made from them! Such fun! Next thing you know they’ll want their own sewing machines! Their other grandmother is pretty crafty too, so a sewing machine might not be such a bad idea. 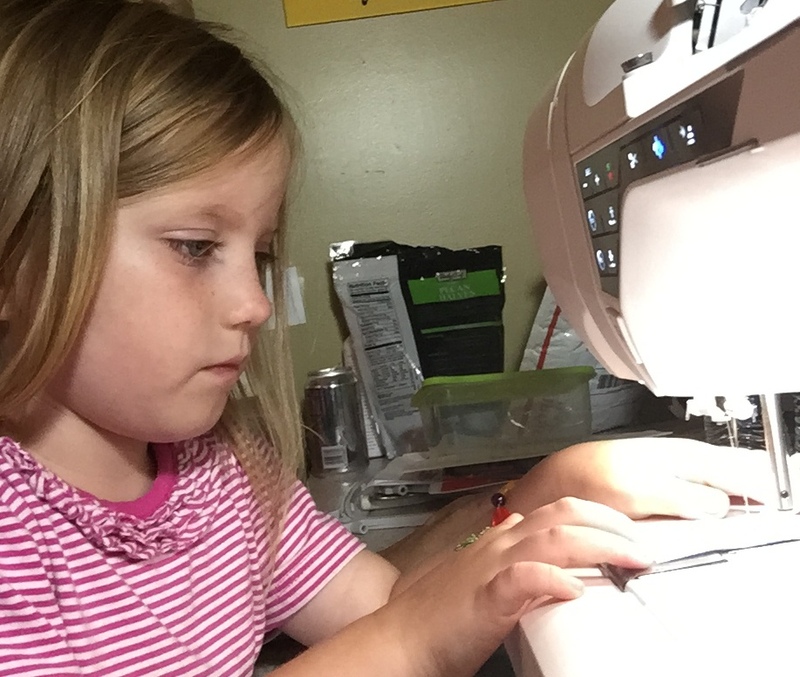 I can certainly see E wanting a sewing machine in the near future. Thanks for stopping by.